Electrons are real Higgs-cutting machines. ONLY 7x chopped/rotated Higgs particles seem to be needed as building blocks for matter, anti matter and radiation. 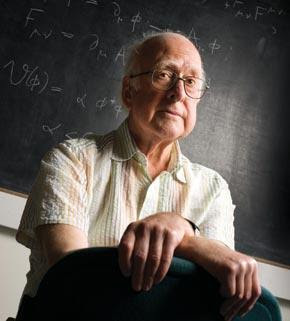 Peter Higgs now 79 years old. It is more than four decades since Peter Higgs predicted the existence of the particle that now carries his name. The Higgs boson helps to explain the origin of mass for some of the fundamental building blocks of matter: Fermions. What Higgs does object to is the label "God particle". Though himself an atheist, he worries that the title "might offend people who are religious". The Higgs field is also called Background Higgs field or Higgs condensate responsible for the so called Higgs mechanism. Fermions are highspeed Higgs cutting machines. Elementary particles with arbitrary spin? or "double spin". It is assumed that after each collision, the ringshaped Higgs particle is split open and transformed into one Gluon / Photon. As a result: Photons are called Gluons if they travel over short distances inside Quark systems like Protons Neutrons and Mesons (Hadrons) and click-on and -of to quarks. Outside these Hadrons, Photons are supposed to be real Photons. There are 5 Gluons (coded UOU-visible light and x-ray, LOL-ROR- electric, LOU-ROU-magnetic). In addition there is one Graviton (LOR), ( not able to click-on to Quarks) so together with the 5 Gl.uons, there are 6 Photons. 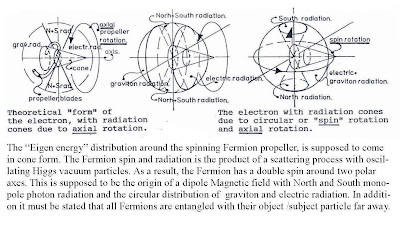 What the shape of the resulting Gliuon Photon will be is dependent of the collision angle with the Fermion and the relative speed differences. (such as for x-ray production inside electron synchrotrons). the UOU photon is supposed to leave the Fermion at the tip of the imaginary rotating cone shape. LOU-ROU is supposed to leave the Fermion in two directions south and North along the blue vertical axis (see Fermion video). We may conclude that these Fermion cutting machines will eat the vacuum Higgs energy away and the multiverse will shrink into a Big Crunch. Attention: only the stringy rotating particles are supposed to be real. The chequered cones, and aiding lines are not. What if you are one of those unfortunate individuals who doesn't see the emperor's new clothes? The first thing a mainstreamer tells you to do is go out there and publish through a peer-reviewed journal. Well, that's easier said than done. Imagine submitting a manuscript arguing against the existence of God to a peer-reviewed inquisition board comprised of 3 Christians 2 Muslims and a Buddhist. What do you think are your chances of being published?